The latest addition to the KTM ADVENTURE line-up, the KTM 1090 ADVENTURE R, promises much with spoked wheels, improved WP suspension and with it much improved offroad potential … perfect for Southern Californian trails. The perfect adventure bike? It’s hard to pin down isn’t it? What is an adventure to you? It could be a trip across country along country or mountain roads. Maybe it’s a journey across a continent taking in every kind of road you can find. Or perhaps for you it is a ride into the unknown, along dirt trails you plotted on a GPS and thought only a dirt bike could do? This is where the new KTM 1090 ADVENTURE R comes in – a bike capable of any adventure and all of the above. KTM ADVENTURE bikes have always been characterized as the sportiest in the adventure market, it is what makes them distinct. Even as the model line-up grew up from 950 to 990 through 1050, 1190 and 1290, the R models held themselves apart from the crowd, pulling in the adventure riders who prioritized offroad capability as much as road skills. Since the first ‘R’ models, distinct styling and purposeful ‘attitude’ via suspension, seat and tires have set them apart. Taking the KTM 1090 ADVENTURE with its steel trellis frame and 75° LC8 V-Twin engine, the KTM 1090 ADVENTURE R is distinguished by spoked wheels, a narrower and bigger 21-inch front tire, crash bars and 220mm suspension travel. Like the 1050 and 1190 models of the last few years, bodywork, shift mechanism, ergonomics, size and shape are all very familiar, making a family connection between the models a natural one. 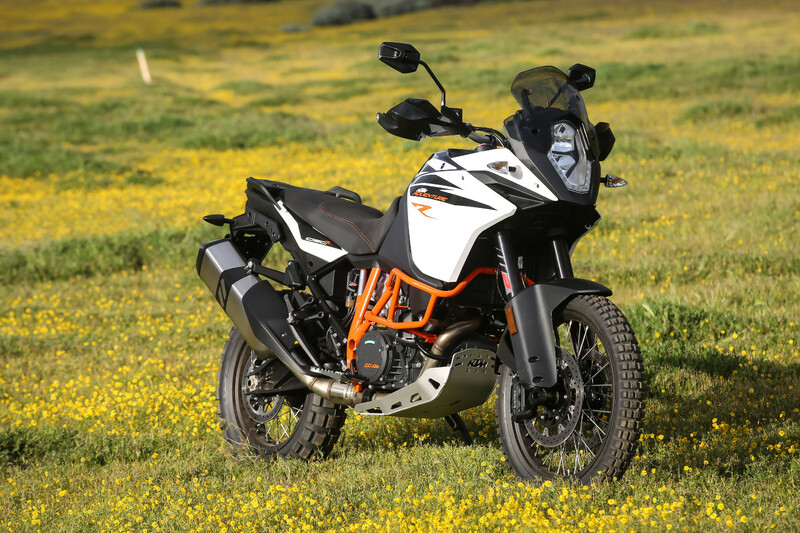 Although the KTM 1090 ADVENTURE is an upgrade for the 1050 in KTM’s ADVENTURE time line, there was no KTM 1050 ADVENTURE R model so the KTM 1090 ADVENTURE R sits as more of a direct comparison (and replacement for) the KTM 1190 ADVENTURE R but with 150cc and 25hp less power. 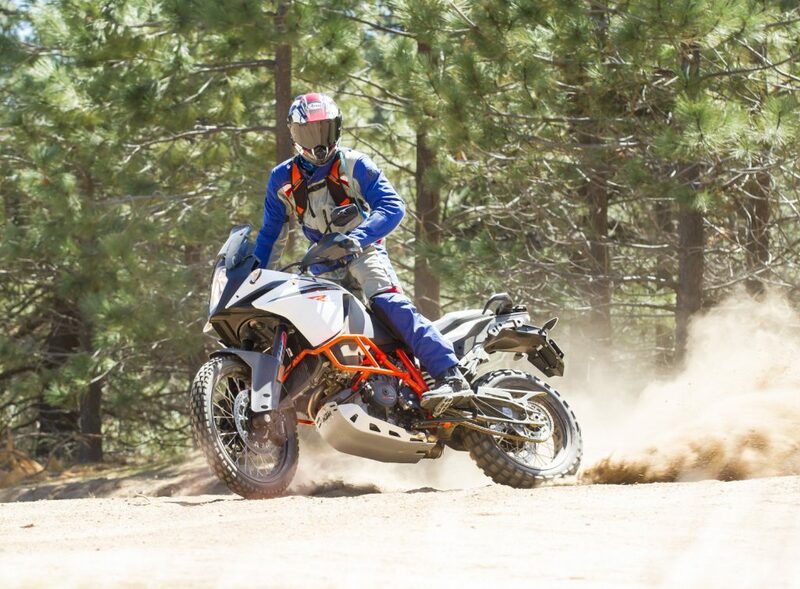 The KTM 1090 ADVENTURE R is also lighter and has a significantly lower retail price. 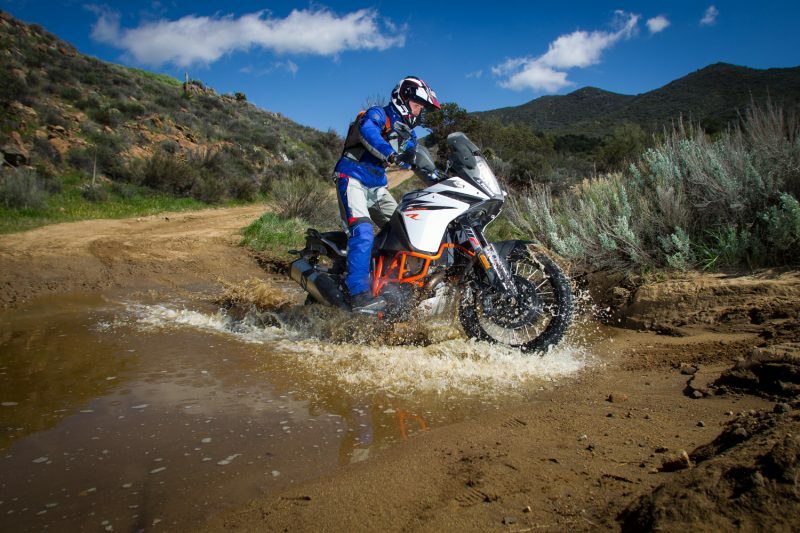 There are differences on the spec sheets across the KTM ADVENTURE range, each with more or less meaning depending on your needs from an adventure bike. If you’re looking at the KTM 1090 ADVENTURE R because you want dual sport ability with your adventure bike then the closest current model, the KTM 1290 SUPER ADVENTURE R might also be on your radar. Though the KTM 1290 SUPER ADVENTURE R is an incredible bike it is a different beast and for many people the lighter and more manageable proportions of the KTM 1090 ADVENTURE R (35kg lighter) will make it an easier bike to live with, as well as more natural off road. With 150cc less than the KTM 1190 ADVENTURE R you might expect less from the KTM 1090 ADVENTURE R but a heavier crank and more responsive throttle make it seem less of a drop. On the road or trail the differences between KTM 1190 ADVENTURE R and KTM 1090 ADVENTURE R are harder to feel than expected. The new generation LC8 engine has been reworked to meet Euro 4 standards too but not, as previously, as an afterthought to meet the restrictions. This time around the engine and exhaust system have been designed to meet the EU laws from drawing board forwards – a first for KTM. The electronics package on the KTM 1090 ADVENTURE R with ride by wire links to four different ride modes: Sport (full power), Street, Rain and Offroad. Both Rain and Offroad modes limit the power to 100hp. On the Southern Californian mix of roads 125hp in Sport mode is flexible and fast through the gears. The transmission feels tighter and more precise in comparison to previous models. While 125hp is a happy amount to live with on the road, it can be a bit too aggressive offroad. Limiting the power to 100hp in Offroad mode softens initial throttle response as well which means better feel and moderate slides (unlike the Rain mode) without allowing speedway-sized slides (like Sport mode). If you can handle it the chassis certainly can take 125hp offroad but Offroad mode is certainly more civilized! Like many of the best current crop of ABS systems, the Bosch system on the KTM 1090 ADVENTURE R is incredibly well developed to work under testing conditions on and offroad. There’s no cornering ABS here but you have to try hard to test this ABS even on the dirt such is the feel for grip from the front tire. Offroad mode allows rear wheel lock-ups if you’re confident to use the rear brake in that way or you can turn it off altogether. Combined, the Offroad ABS setting is a recipe for fun and the feeling of slides but with the safety net of front anti-locking system to help. 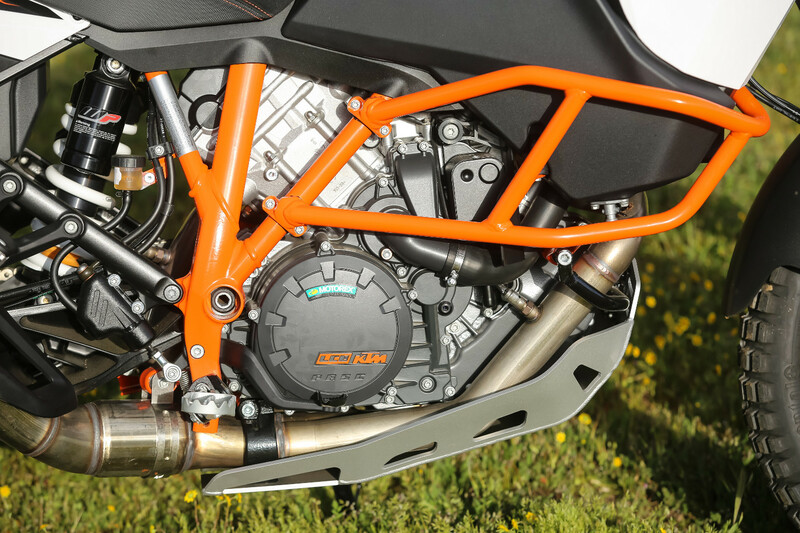 The new WP fully adjustable suspension front and rear is one of the KTM 1090 ADVENTURE R’s strongest positives. 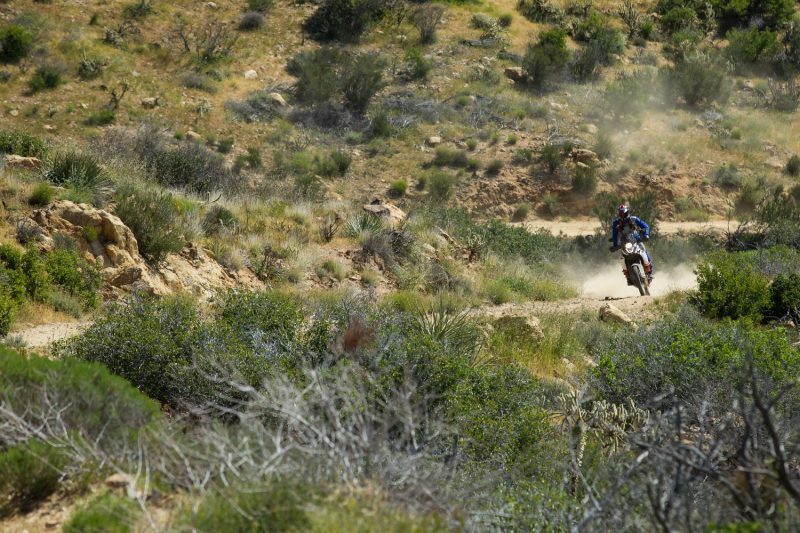 A mixture of grippy Southern Californian roads, single track mountain lanes littered with rain wash and gravel and a huge variety of dirt trails was as good a test of an adventure bike as you could dream up. It is no coincidence this is also where the bike’s suspension was developed in part by KTM’s development rider and 4-time Baja 1000 winner, Quinn Cody – he’s a great guy to try and hang on to as we make our way along some of the best trials imaginable from the San Bernardino hills to the Borrego desert. 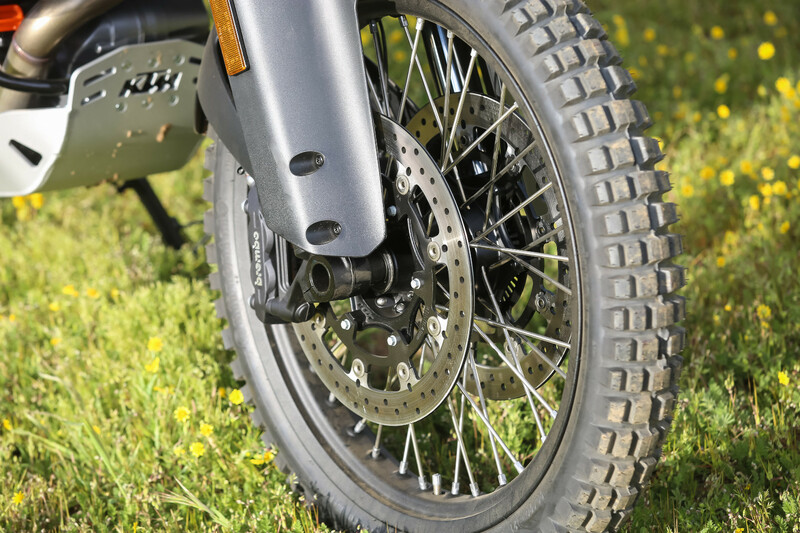 Though not as technically sophisticated as the KTM 1290 SUPER ADVENTURE R models’ active suspension, the KTM 1090 ADVENTURE R’s 220mm suspension travel makes for a versatile bike across a huge range of riding terrain. Offroad there’s a distinct improvement – you can push harder than you think. Previous R models always worked well offroad but their WP suspension compromised a little too much on road, better offroad used to mean too stiff on it for some. That’s no longer the case on road simply because there’s less compromise needed with the new WP suspension. Rather than being too stiff, if you’re inclined to ride a bike more like a sports bike than a tourer on road, something the KTM 1090 ADVENTURE R encourages, then this new model is a big step forward. Even if you never hit the dirt KTM’s new 1090 ADVENTURE R is a bona fide adventure bike. Smaller and more agile than many on the market it hustles where some lumber and in a world where so many adventure bikes are content to look the part but not deliver when you actually take them offroad, the KTM 1090 ADVENTURE R has all the credentials. Ask some to hit a stony, mountain hill trail and they struggle because of weight, poor suspension, wrong wheel sizes and no feel for grip. KTM’s 1090 ADVENTURE R has none of that, more than simply coping with the job it encourages you to take those kinds of trails. On road it is a surprise too with an alert engine and new suspension which turns it almost into an all-terrain sports bike. The KTM 1090 ADVENTURE R is the genuine adventure bike article.